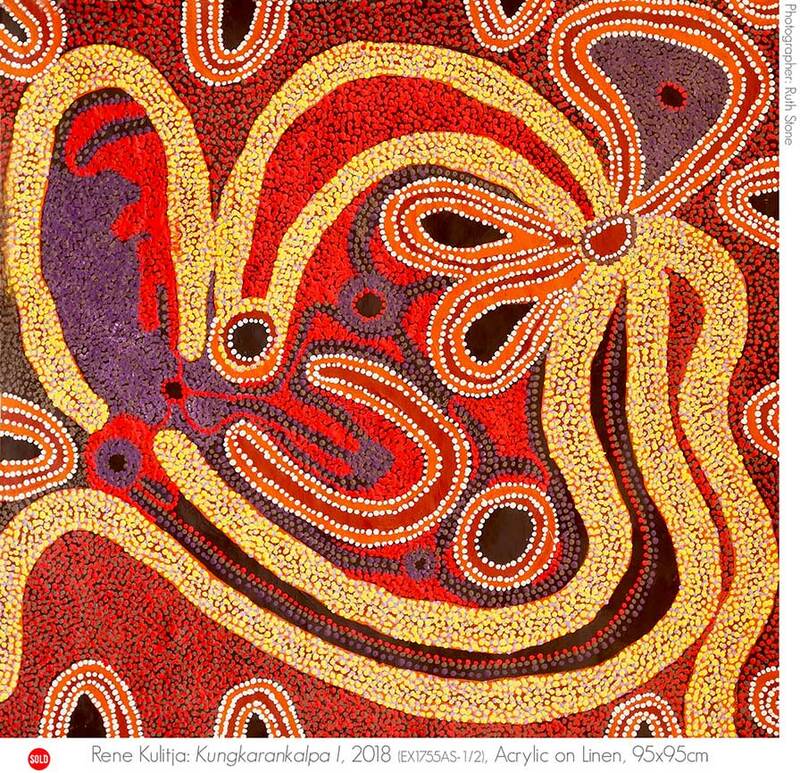 Kunturu Kulini (Heart Listening)| Maruku Arts | Artsite Galleries | Sydney | 06 - 28 October 2018 | Maruku Arts | Rene Kulitja | Lucinda James | Francine Kulitja | Kathryn Queama | Margaret Cotchilli | Niningka Lewis | Selina Kulitja | Yuka Trigger | Freda Teamay | Nelly Patterson | Beryl DeRose | Marlene Connelly. Kunturu Kulini (Heart Listening) ~ Maruku Artists | Rene Kulitja | Lucinda James | Francine Kulitja | Kathryn Queama | Margaret Cotchilli | Niningka Lewis | Selina Kulitja | Yuka Trigger | Freda Teamay | Nelly Patterson | Beryl DeRose | Marlene Connelly. "We listen to our grandfathers and grandmothers and we follow their teachings: of all our lands and the stories and law that they hold. We can feel our families, our country, our culture in everything we do. We hear everything in our hearts. We hear it all with our heart, mind, body and soul as one." 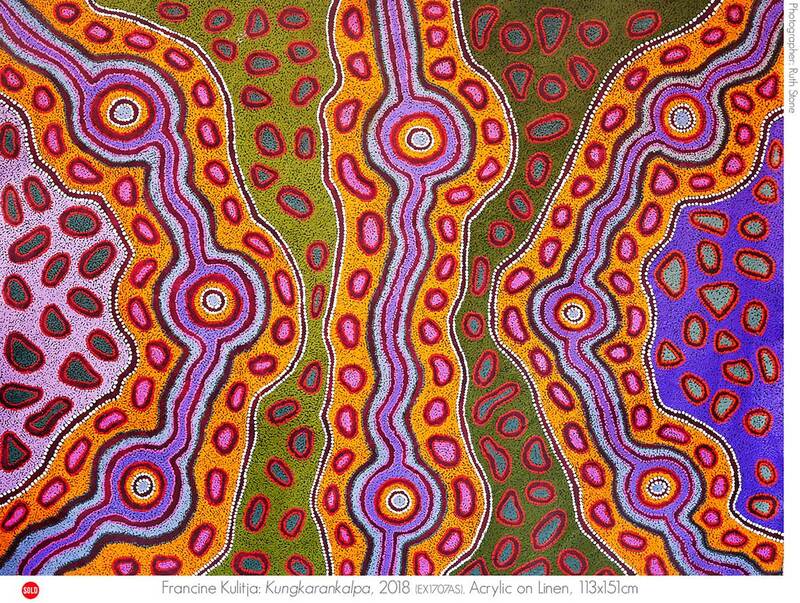 Rene Kulitja is most recognised for her painting Yananyi Dreaming which covered the fuselage of a QANTAS Boeing 737-800. She is a respected senior community representative, cultural custodian and a founding director of Walkatjara Art. Rene is a current Director and previous chair of Maruku Arts. She has exhibited in major exhibitions regionally, nationally and internationally and has collaborated widely over the years, including with Fiona Hall for the Venice Biennale in 2015. Most recently she has toured America with the Central Australian Aboriginal Womens Choir, performed ceremony at the Department of Foreign Affairs and Trade for NAIDOC Week, lead discussions with the Seven Sisters Songline curatorium, and has just completed a Tjanpi Weavers collective installation piece for the National Museum of Australia with artists including Niningka Lewis. 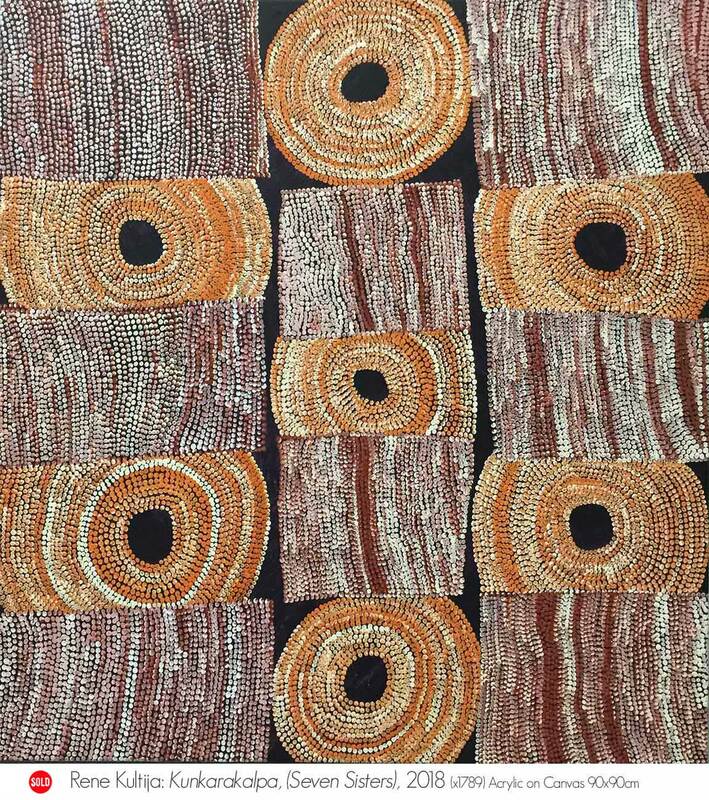 Public Collections include: Walkatjara Art Archive; Araluen Arts Centre Collection, NT; Australian National Gallery, ACT; UNESCO, Brussels; Environment Australia Collection, National Museum of Australia; Maruku Arts Collection. 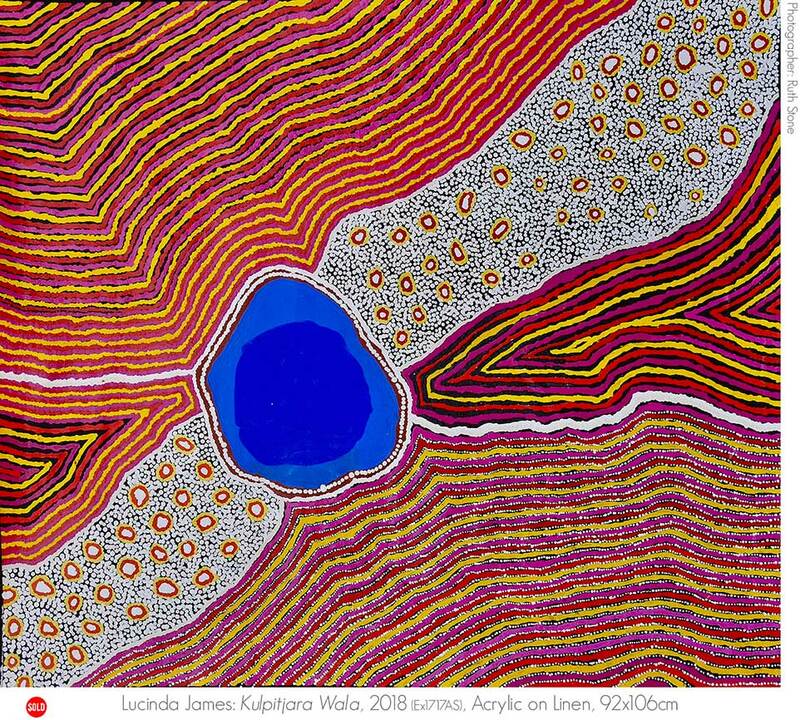 Lucinda James is a young Aboriginal woman who grew up in Mutitjulu within the Uluru Kata Tjuta National Park. The grandaughter of Maruku founders, Walter Puktiwara and Topsy Tjulyata, and niece of Rene Kulitja, she has grown up with a strong carving and painting background. This is Lucinda´s first exhibition. Francine Kulitja is the eldest daughter of Maruka Director Rene Kulitja, and granddaughter of renowned wood carvers and Maruku founders, the late Topsy Tjulyata and Walter Pukutiwara. She grew up in Kaltukatjara (Docker River) in the far south west corner of the Northern Territory and spends time in the Mutitjulu Community in the Uluru-Kata Tjuta National Park with her family, who have always been strongly involved in traditional land management, tourism and the arts. 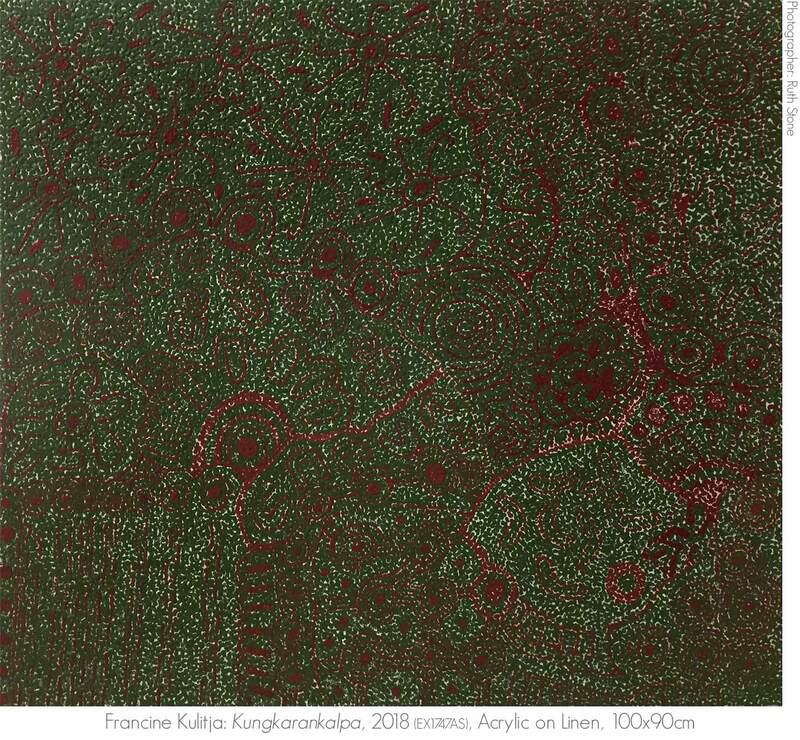 Francine Kulitja paints the Tjukurpa and Creation Stories including the Seven Sisters or Kungkarankalpa stories she has inherited through her mother, her grandmother and her grandfather. 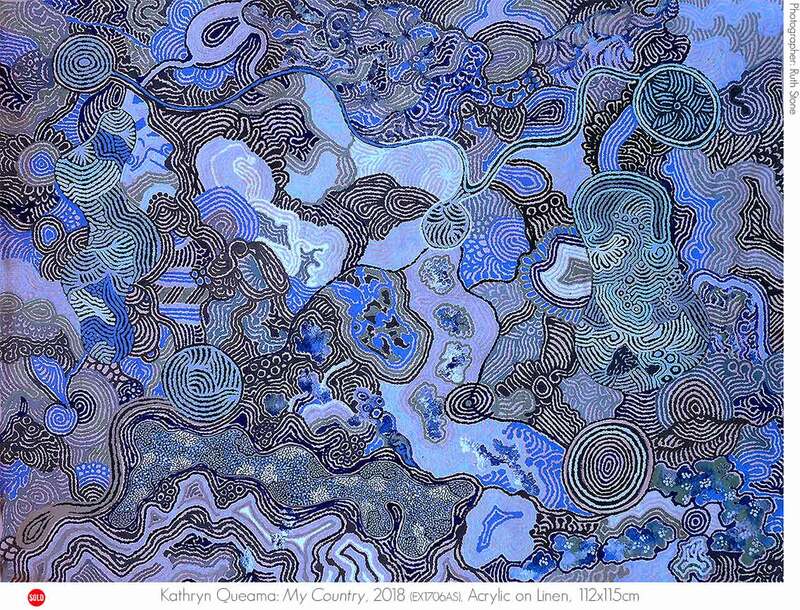 Kathryn Queama is minyma Anangu, a Pitjantjatjara woman from the Central Desert. As well as working in the Docker River Store and for Nyangatjatjara Aboriginal Corporation, she has been learning carving from her mother in law, Nyinku Kulitja. Her traditional skills have been passed on through the Tjukurpa, the Law and way of life governing their country. 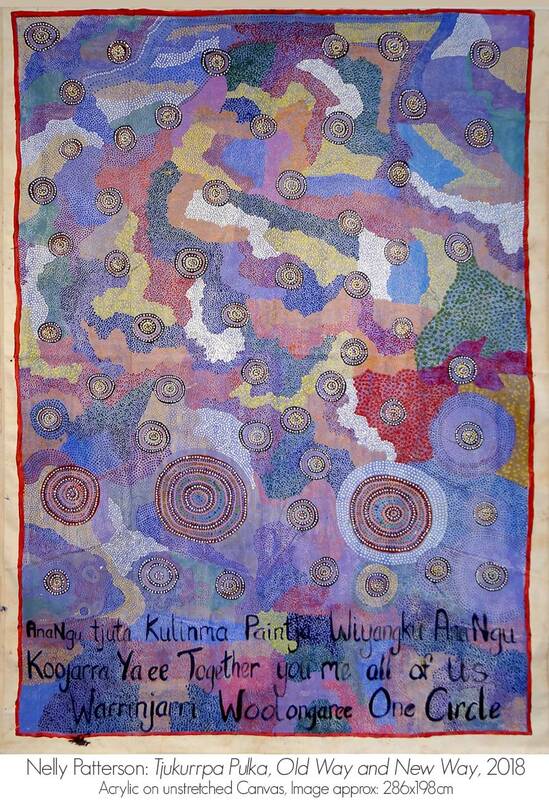 The artists camp at Uluru, provided Kathryn with the opportunity to work on a large scale, on linen. This is Kathryn´s first painting exhibition. 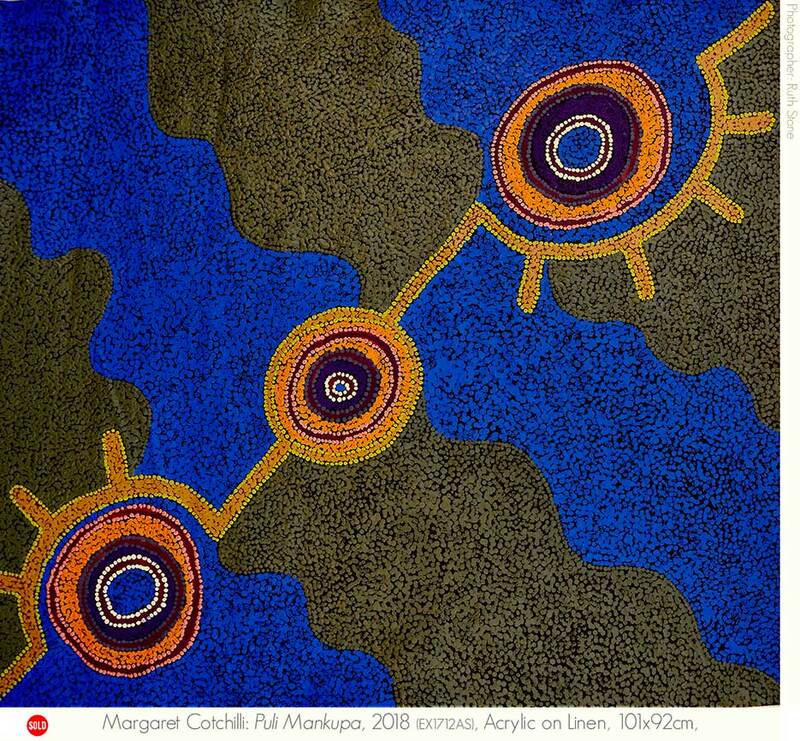 Margaret Cotchilli is a young Aboriginal woman from the Central Desert and the granddaughter of artist, Rene Kulitja. Margaret has only recently started painting and is becoming recognised as an emerging artist under the guidance of Rene Kultja. I feel connected to my culture and family through painting. This is Margaret´s first painting exhibition. 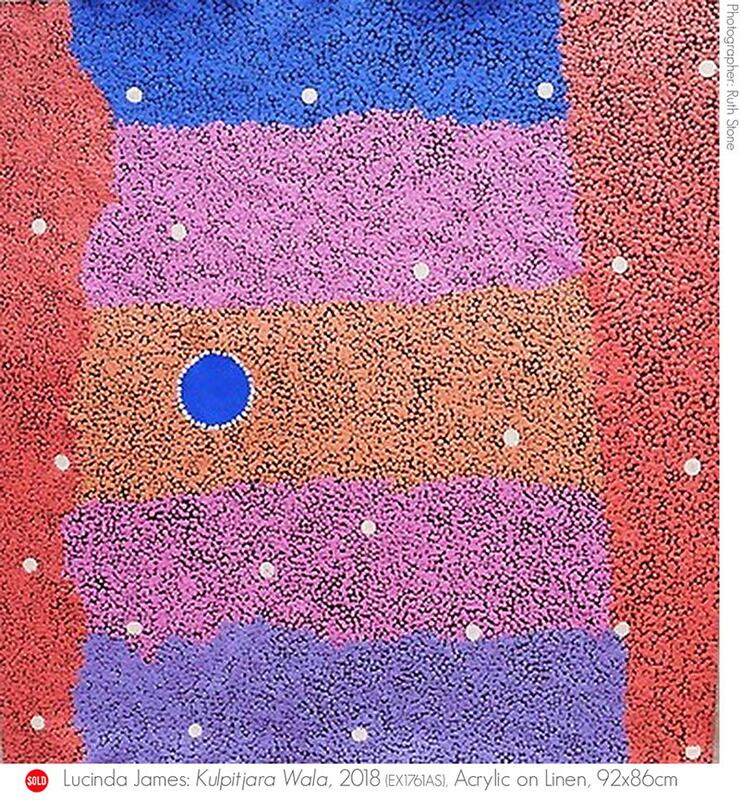 Niningka Lewis was a finalist in this year´s 2018 National Aboriginal and Torres Strait Islander Art Award (NATSIAA) at The Museum and Art Gallery of the Northern Territory (MAGNT). Niningka Lewis has had multiple solo exhibitions, with over 40 curated and group exhibitions in Australia including the 2013 String Theory, Focus on Contemporary Australian Art exhibition at Sydney´s, Museum of Contemporary Art. Born in the 1950s between the mission settlement of Areyonga and Tempe Downs cattle station in the Northern Territory, she grew up in the Ernabella area, making regular family trips throughout her traditional lands. After living and working in Kalka for many years and then Mutitjulu in the Uluru-Kata Tjuta National Park, she is now based back in Ernabella. 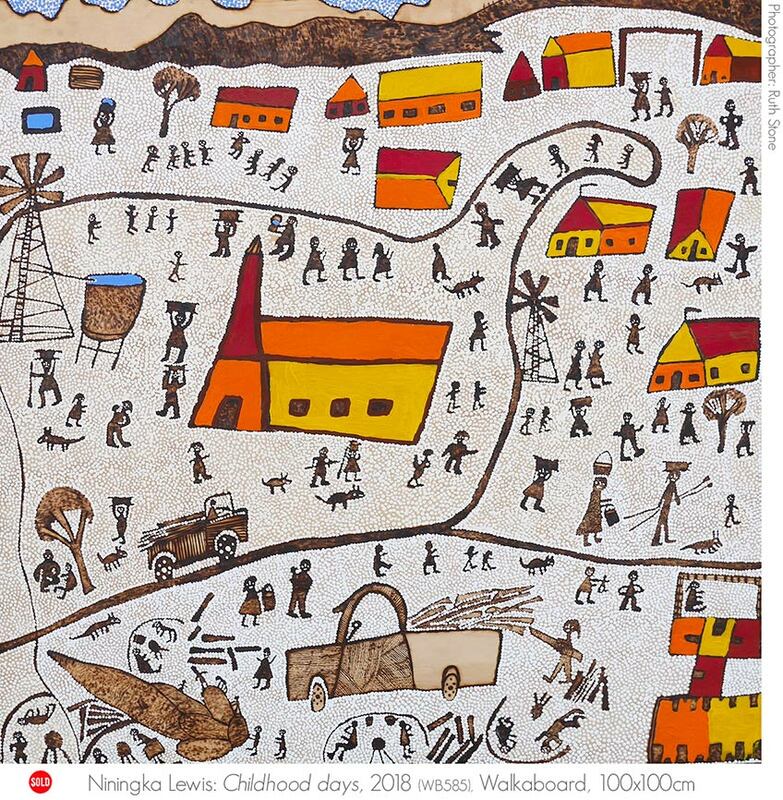 She is a leading artist with Ernabella Arts as painter/ceramicist, and works with Tjanpi Desert Weavers, sculpting and weaving native grass artefacts. 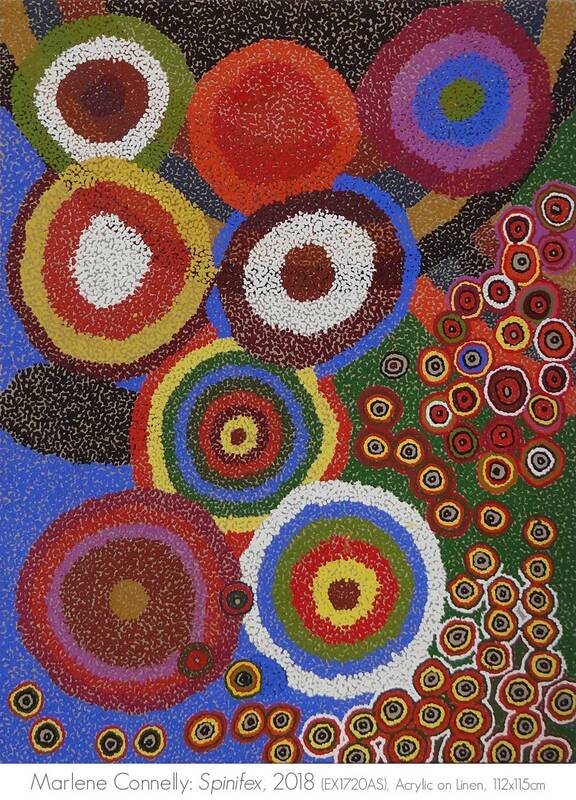 Public Collections include: Museum of Contemporary Art, Sydney; AGNSW, Sydney; Araluen Arts Collection, NT; Art Gallery of South Australia; Artbank; Australian Museum; Object Gallery, NSW; W & V McGeoch Collection. 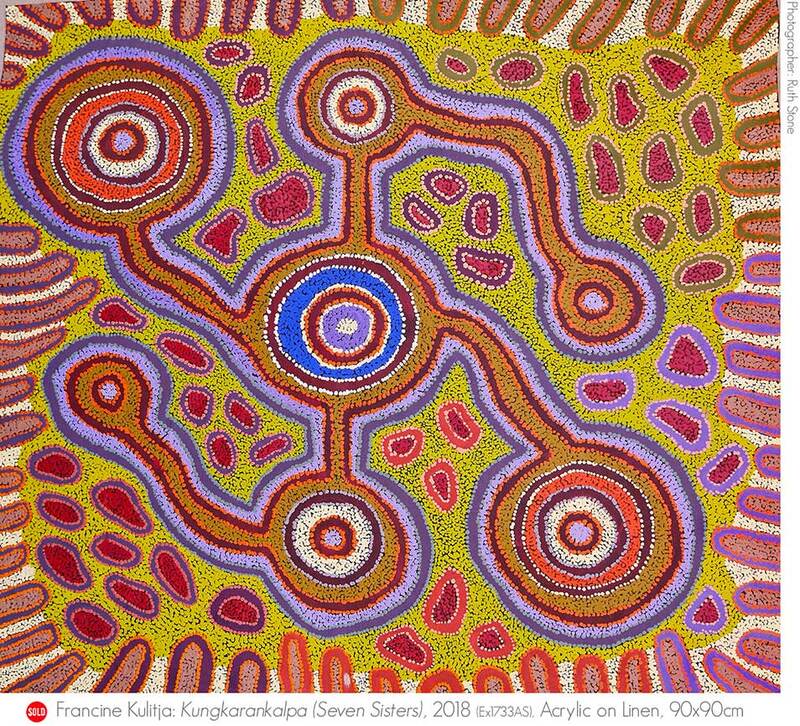 Selina Kulitja is minyma Anangu, from the Central Desert area of Australia. 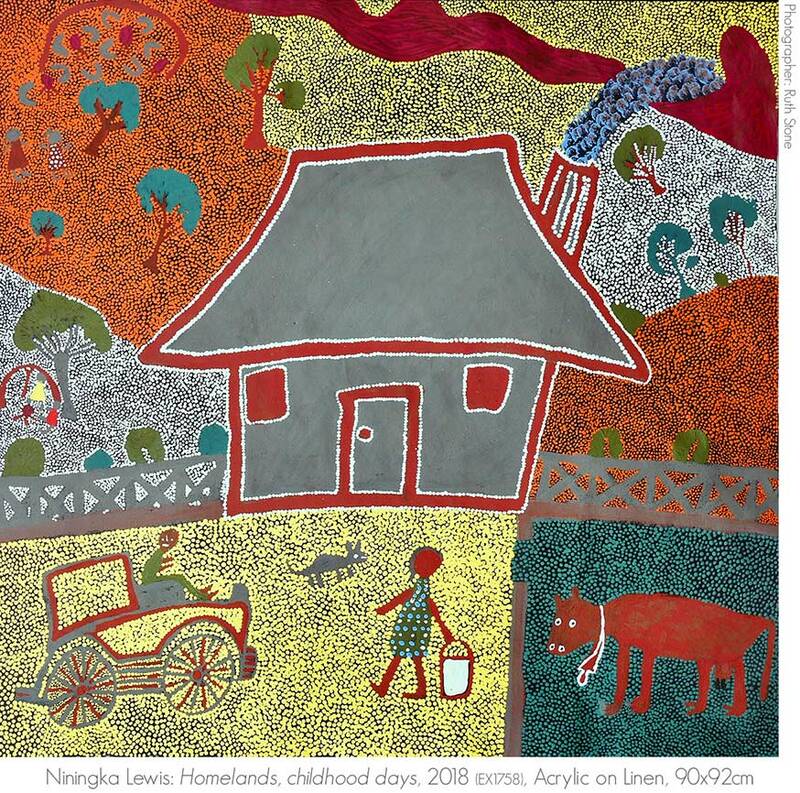 Part of her childhood was spent in the community of Areyonga before her family returned to their ancestral lands and the community of Kaltukatjara, or Docker River in the Petermann Ranges. 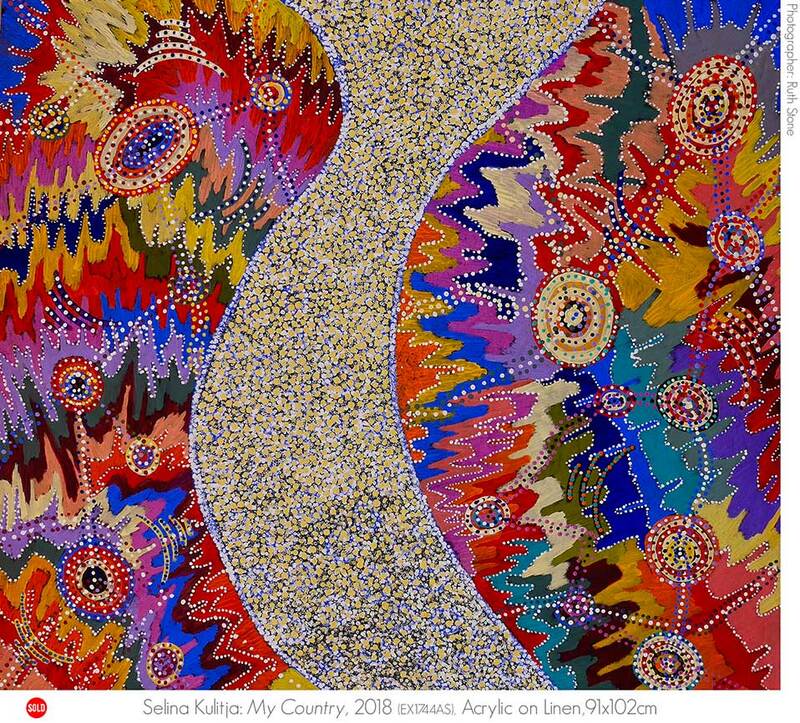 Her mother, senor artist, Nyinku Kulitja, has taught her skills through the Tjukurpa, the Law and way of life governing their country. 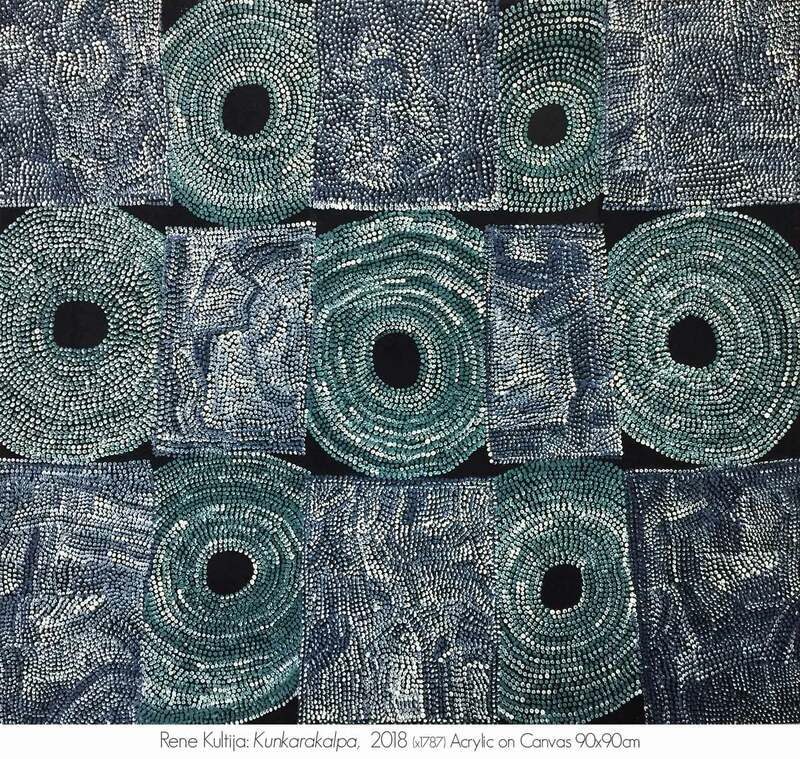 Selina began carving in her own right in the early 1990s and began painting with Maruku in 2007 and takes inspiration from her sister-in-law, Rene Kulitja. Recently Selina has become an ambassador for Maruku, bringing her people´s art to a wider audience through workshops and exhibitions. Selina also performs a crucial role as a Health Worker in her local community clinic and is an active community and council member. Public Collections include:The Imago Mundi Collection, Treviso, Italy. 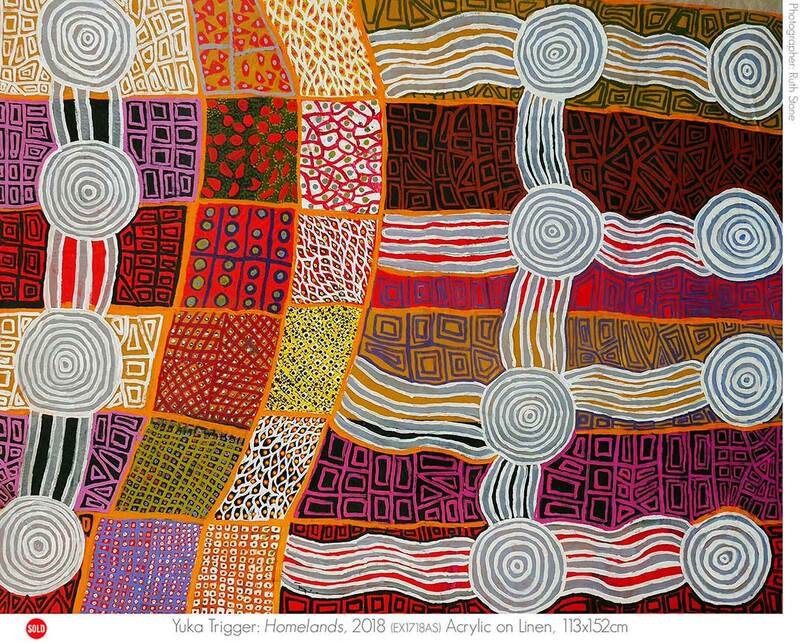 Yuka Trigger was born in the bush to the east of Uluru, and grew up at Areyonga in the Northern Territory. A Senior Traditional Owner for Uluru, she has worked as a school teacher, an Environmental and Cultural Management Consultant, Tour Guide, Artist and Pitjantjatjara Language teacher. A previous Maruku Chairperson, long time Uluru Kata Tjuta Board of Joint Management, Mutitjulu council (and former chair) and Health council member, Yuku stands strongly for her people´s traditional values as well as engaging in the challenges of current times. Yuka Trigger has also been involved in the development of Mani Mani a theatrical interpretation of Tjukurpa from Pirupakalarintja, west of Uluru. Yuku is the senior dancer for Kuniya or Python Tjukurpa at Uluru as seen in the National Park Cultural Centre. She is an experienced wood carver and a recognised grass sculptor of Tjanpi Desert Weavers. Her work was exhibited in the Art Gallery of South Australia exhibition Sappers & Shrapnel: Contemporary Art and the Art of the Trenches in 2016-2017, and is also seen on the local Uluru shuttle bus. 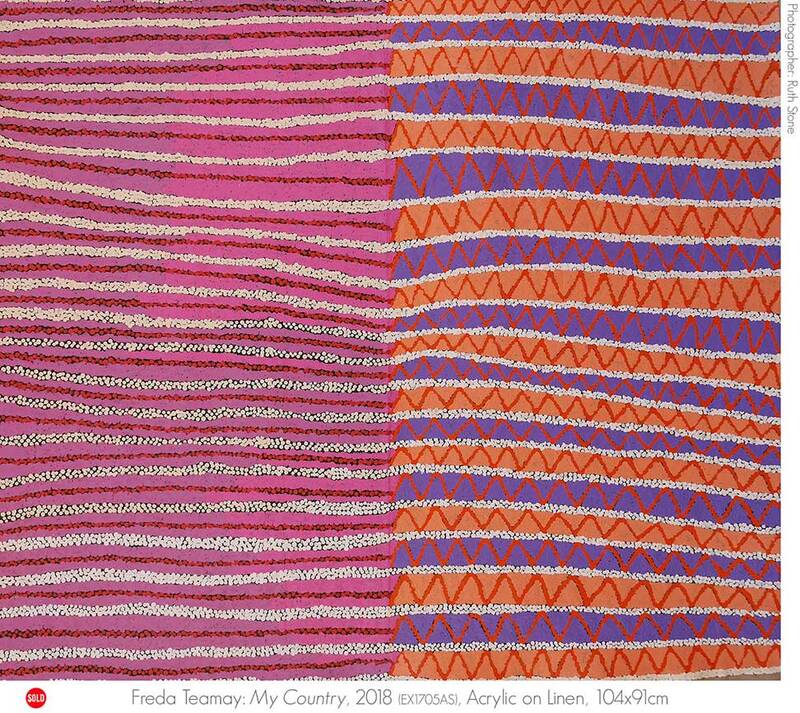 Freda Teamay is a contemporary Tjanpi Desert weaver who has exhibited at the Art Gallery of South Australia along side Sappers & Shrapnel: Contemporary Art and the Art of the Trenches in 2016-2017. Sappers & Shrapnel also reminds us that conflict occurs in broader contexts than theatres of war. The Tjanpi Desert Weavers (Rene Wanuny Kulitja, Judy Ukampari Trigger, Erica Ikungka Shorty, Lucille Armstrong, Mary Katajuku Pan, Janet Inyika, Niningka Lewis and Freda Teamay) use camouflage military garments for Tjituru-tjituru, 2016, evoking the enduring anxiety of the dispossessed. Nelly Patterson´s tribal name is Napananga. She is the custodian of the dreaming story of Atilla, Uluru and Kata Tjuta, and one of the last senior Anangu law women of the Anangu people. Born in the 1930´s, Nelly notes, my country, when I was born was a really really strong centre for sacred law for all the Anangu People. Nelly grew up in the traditional way near Pipalyatjara in the Anangu Pitjatjantjara/Yankunytjatjara Lands, walking nomadically in the desert with her tribe, and remembers participating in law ceremonies with the old people. She remembers all the desert tribes coming to her homeland for a big big ceremony all the way from Western Australia, South Australia and the Northern Territory, even from the East to join in a business meeting for the men, as had been carried out since ancient times. Ceremony is important to teach the natural law that was passed on at the beginning of time when the Earth was created. Anangu people remember how to look after the Earth. All of the Elders are holding on to this law and culture. We need to pass on this knowledge to the Earth now through our youth. Nelly is teaching her Anangu people the Tjukurpa (prononced Choo-kur-pa), the ancient law and lore of the desert passed down from Elders to youth from the time before this time began. Public Collections include: National Museum of Australia; Australian National Gallery, Canberra; Museum of Ethnology, Osaka, Japan; National Museum of Victoria, Melbourne. Beryl DeRose is minyma Anangu, an Aboriginal woman from Kaltukatjara (Docker River) and now living in Mutitjulu within the Uluru-Kata Tjuta National Park. A wood carver (punu) and talented emerging painter with Walkatjara Art, she performs a key role there as an art centre worker and advisor. 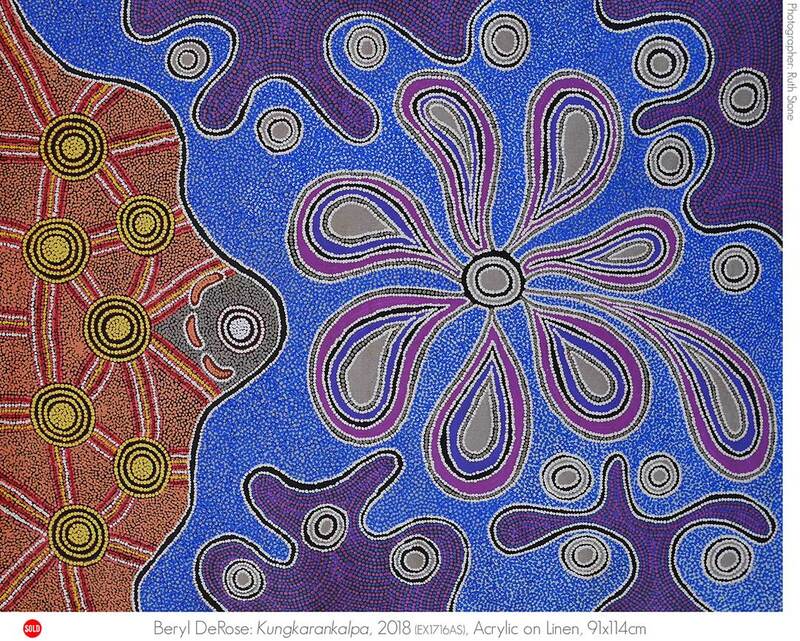 Beryl has been exhibiting since 2009, and her work was commissioned for the 2017 Uluru, Tili Tjuta, Field of Lights and in 2016 she participated in the 2016 SciArt project,Iwara (Tracks), Indigenous perspectives & scientific modeling celebrated together through art. Proportionally, we are the most incarcerated people on the planet. We are not an innately criminal people. Our children are aliened from their families at unprecedented rates. This cannot be because we have no love for them. And our youth languish in detention in obscene numbers. They should be our hope for the future. These dimensions of our crisis tell plainly the structural nature of our problem. This is the torment of our powerlessness. We seek constitutional reforms to empower our people and take a rightful place in our own country. When we have power over our destiny our children will flourish. They will walk in two worlds and their culture will be a gift to their country. Anangu are the Pitjantjatjara Yankunytjatjara, Ngaanyatjarra traditional owners from the Western and Central Deserts of Australia - also known as the NYP and APY Lands. Maruku Arts is one of the oldest independent not-for-profit arts organisations in the region, with 35 years experience serving communities across three states: Northern Territory, South Australia, and Western Australia. Maru means ‘black’ and Ku means ‘belonging to’ which translates as Belonging to Anangu (the Aboriginal people of the region). The organisation was established around the idea that traditional methodologies together with contemporary art forms, can be supported and promoted by their own people from their own homelands. The vision asserts a powerful connection to country. 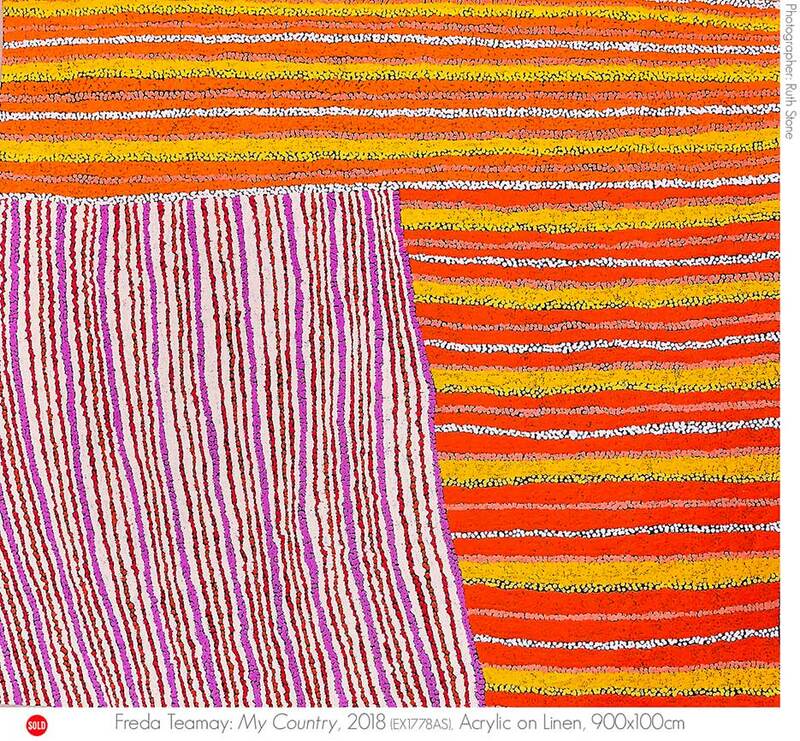 Based at Mutitjulu, in Uluru Kata Tjuta National Park, Maruku represents up to 800 artists across 22 communities in the region. Before stories and motifs began to emerge in contemporary practices, like painting on canvas, there was carving, engraving, painting on the body for ceremony, etched maps and stories on rock faces and the passing down of sacred knowledge through a version of the classroom blackboard - sand drawing. In the early 1980s Maruku´s founding members understood their organisation would protect and promote Anangu culture, sovereignty and custodianship and would create an opportunity for Anangu voices to speak and live on for future generations to access. Anangu have been resilient despite a history fraught with struggle: colonial invasion, frontier wars, mission days, stolen generations, nuclear testing, the Land Rights struggle, the 1985 Handback, the Intervention, disproportionate incarceration rates and the list goes on. Through the sharing of their knowledge Anangu are able to trigger curiosities about Indigenous cultures, and help audiences understand that there was civilisation in Australia long before Europeans arrived on their first ships; contrary to the Terra Nullius hunter-gatherer school of thought and the misleading version of history that is taught in schools. Anangu recognise that we share space, that we do not own it. The facades covering the culture wars that surround us are crumbling, and reveal a space for new ways of thinking. The truth about Indigenous cultures, their literacies, technologies and systems are aligning within this space, as the place for the oldest knowledge to emerge in the 21st century. Living in Mutitjulu I have learnt transformative lessons about the unsavoury history of this country and the experiences of Indigenous people their graciousness and dignity, ancestral and spiritual knowledge and the contemporary realities they experience also as modern people dealing with modern realities. 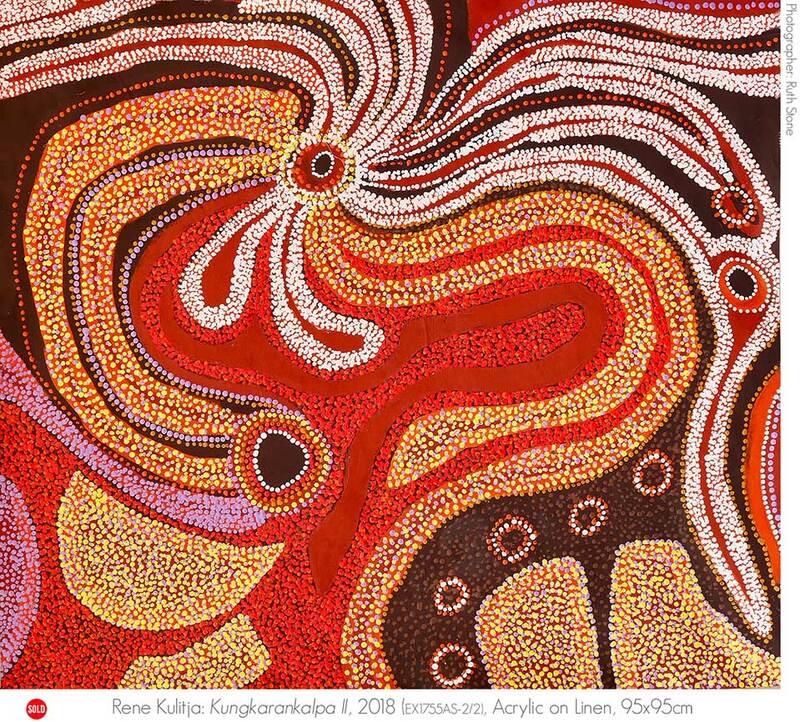 The daughter of Maruku founders Walter Pukutiwara and Topsy Tjulyata, Rene Kulitja is most recognised for her painting in the year 2000 which was the first of a series of Aboriginal and Torres Strait Islander paintings to cover the fuselages of Qantas planes. She is prolific in many fields: a punu-maker, painter, tjanpi-weaver, land manager, mother, grandmother and aunty, she is respected as a senior community representative and cultural custodian. She has exhibited in major shows regionally, nationally and internationally and has collaborated widely over the years, including a presence at the Venice Biennale in 2010 with Fiona Hall. Most recently she has toured America with the Central Australian Aboriginal Womens Choir, performed ceremony at the Department of Foreign Affairs and Trade for NAIDOC Week, led discussions with the Seven Sisters Songline curatorium, and has just completed a Tjanpi Weavers collective installation piece for the National Museum of Australia. Rene was involved as a senior Anangu representative in the 2017 National Constitutional Convention held at Uluru. Following this summit she directed the painting of the Statement from the Heart in canvas form. This painting was able to bind the discussions that took place with the written statement in a tangible way. Resolutions from the Convention were delivered to federal parliament while Malcolm Turnbull was still the Prime Minister of Australia and were largely dismissed, despite being a defining moment in the history of Indigenous Struggle. Meanwhile the painted Statement from the Heart has travelled extensively around Australia, gathering signatures and support from Indigenous and non-Indigenous Australians alike. The painting became the starting point for discussion for this exhibition and the artists came up with a concept they named Kunturu Kulini, meaning Heart Listening. My heart leapt with excitement when Rene discussed this idea. 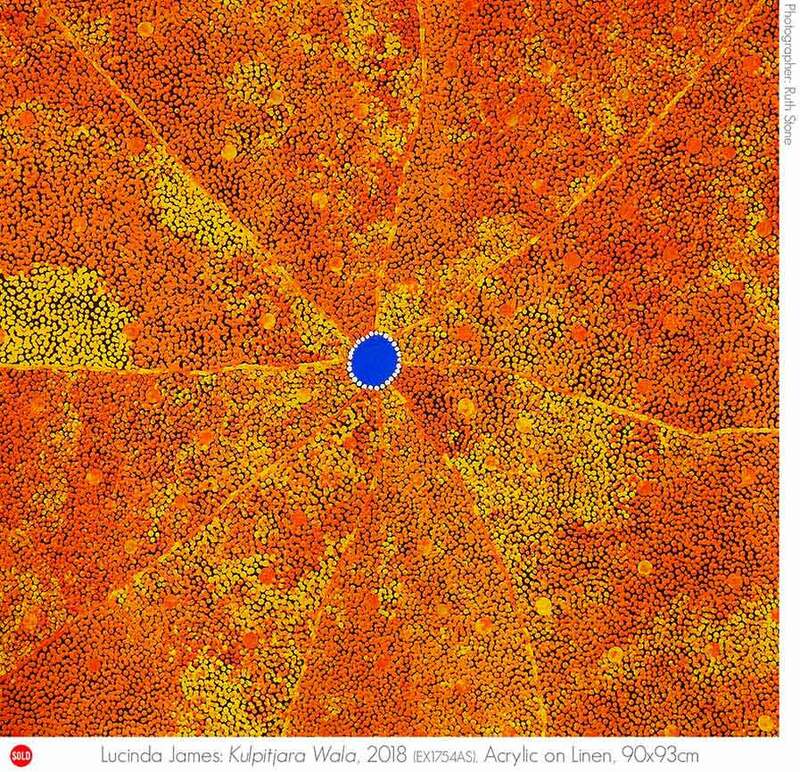 This kind of project has not been undertaken for some time at Maruku as our main focus is Punu (living wood) and this opportunity has allowed their painting to flourish. Ruth Stone, Art Projects Coordinator. This exhibition became an opportunity to create a show with Maruku collective artists, who had expressed the desire to paint for an exhibition. It meant stepping into a renewed strategy for studio practice in painting, especially for the younger artists who have had little opportunity to create work for exhibition. A series of meetings led by senior artist and Maruku director Rene Kulitja were held with the group: Niningka Lewis, Selina Kulitja, Kathryn Queama, Yuka Trigger, Francine Kulitja, Lucinda James, Beryl De Rose, Marlene Connelly, Margaret Cotchilli and Freda Teamay, and later Nelly Patterson. These meetings culminated in a bush camp workshop, with extended family, kids and camp dogs all in tow. 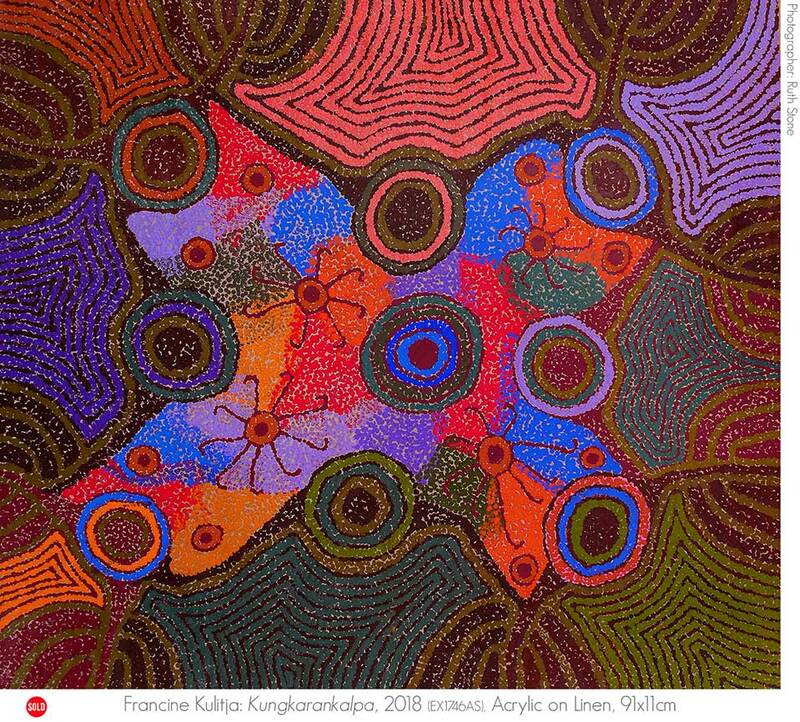 For a week the artists camped in the sand dunes near Uluru; hauling firewood and water, organising the camp kitchen, mixing paint, cutting canvas, talking and not talking, resolving dramas, telling stories, singing, dancing, fighting, crying and praying. It is from here, the Heart Listening exhibition has evolved.